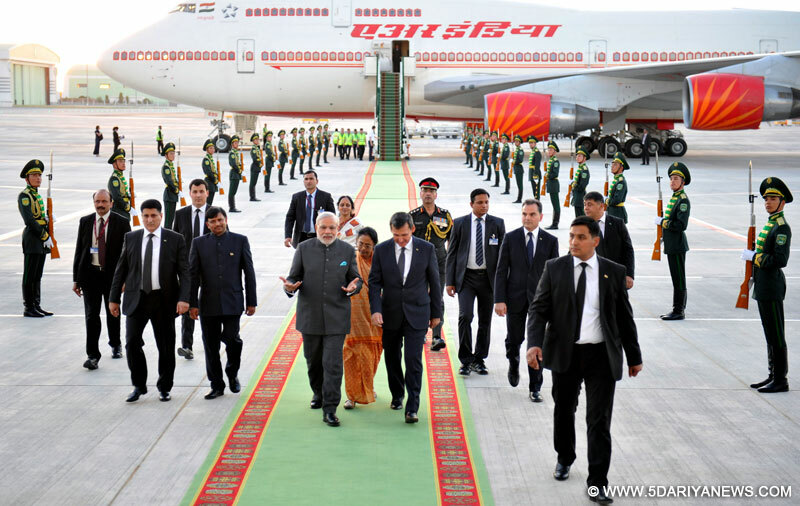 The Prime Minister,Shri Narendra Modi being welcomed by the Deputy Prime Minister and Minister of Foreign Affairs of Turkmenistan, Mr. Rasit Meredow on his arrival at Ashgabat International Airport, Turkmenistan on July 10, 2015. Prime Minister Narendra Modi on Friday arrived in the Turkmenistan capital of Ashgabat on the fourth leg of his Central Asian tour. "Salam Turkmenistan! PM @narendramodi arrives at Ashgabat Airport on the fourth leg of his Central Asia tour," external affairs ministry spokesperson Vikas Swarup tweeted.Modi will also travel to Kyrgyzstan and Tajikistan before returning home on July 13.He has already visited Uzbekistan and Kazakhstan and also attended the BRICS and SCO summits in Ufa, Russia.